After you reconnaissance of a pool you are about to fish ,plan when and how to fish the different stretches of water. I pay particular attention to the sun’s position and will make an effort to avoid having the sun behind me while I fish. Shadows thrown into the water by the fisherman and the rod, line and leader may scare the fish. Another aspect that I try to access is where the fish may have its holding spots during the day. Many people believe that a fish will stick to a single holding spot until it decides to move farther upstream. I have a different view. 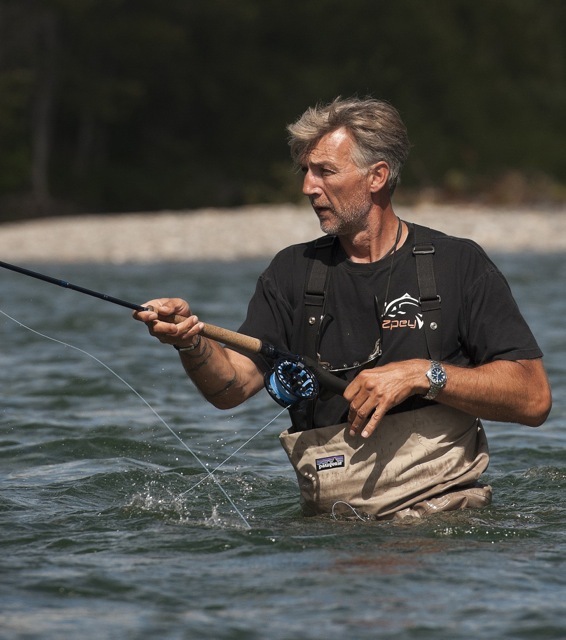 I often see how salmon and sea-trout move around depending on the suns positions, making me believe that you have to be ready to seize an opportunity- and the most opportune time to fish a holding area is when a fish has just taken its spot. Right then the fish is active and easy to fool! Now you can decide on the details of your fishing plan. It’s all about trying to figure out how to fish the fly depending on different holding spots. Maybe you have places you need to wade into; in other places you may need to crawl on your hands and knees to fish a bank side current without spooking the fish. This is where good casting techniques come into the picture. With an understanding of how the fly cast is structured and preformed, you will be at liberty to cast from every possible and impossible angle and position. Undoubtedly, the time spent building up your casting skills will land you more fish and give you greater pleasure doing so. It is your reward for hanging in there with the “carbon flexing” on the lawn.